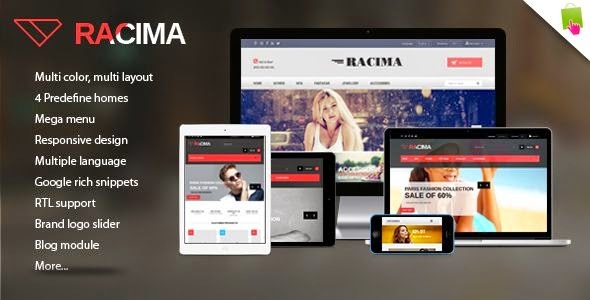 Racima is a Premium Responsive Prestashop theme 2015 with advanced admin module. It’s designed for selling fashion, shoes, glasses, accessories or any kind of eCommerce store. It is designed with focus on user experience and usability, to make Prestashop shopping easy & quick. Its easy to customize, fully responsive, comes with lots of required features & display to all devices. This prestashop theme includes several prestashop extensions including Layered navigation block and top-sellers block module that will help you improve your sales. On the main page you can quickly show their best products with best prices such as : new products, featured products, ... In the homepage, you can write the blog posts with nice images and texts that provides customers with shop information. Item Reviewed: Racima Multi Store Responsive Prestashop Theme 2015 9 out of 10 based on 10 ratings. 9 user reviews.